There are times when Sarah writes up Flatiron Lunch, and I wish those spots would expand to Midtown. Spreads is definitely one in that category — I had a fantastic lunch at their 30th street location — and when I read about Kobeyaki last year I was very intrigued by the burger and fries she liked so much. 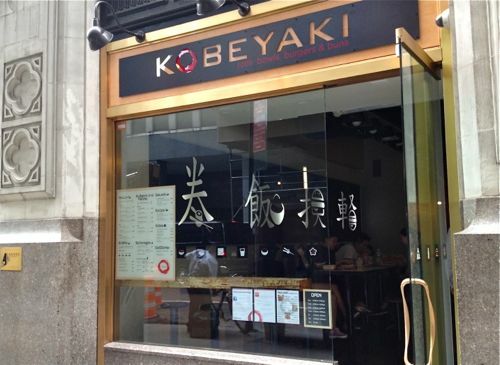 Luckily, Kobeyaki signage popped up on 40th street earlier this spring, and they opened just a few weeks ago. And there’s a menu item I somehow hadn’t noticed before — soft shell crab bun, I couldn’t wait to eat you! 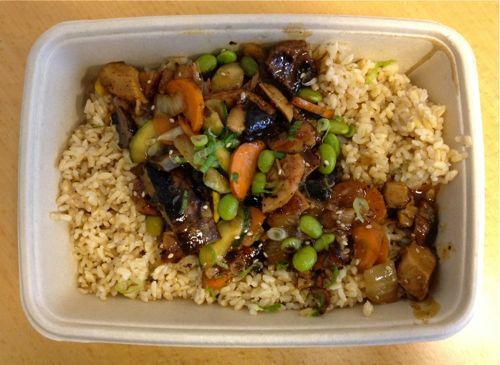 But first, on the healthier end of the spectrum, Kobeyaki has several bowl options, including this grilled chicken bowl with brown rice and teriyaki sauce ($8.97). Instead of rice (white or brown), you could also try udon noodles or salad as your base for your bowl. 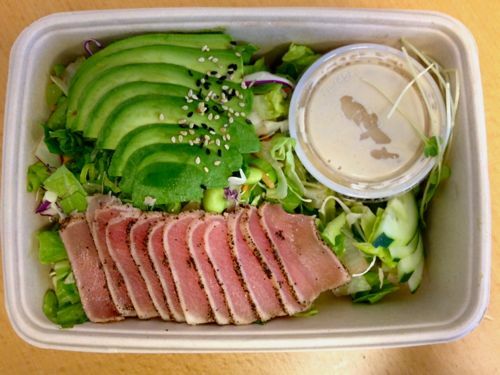 If you’re used to the quickly chopped and tossed together salads at Chop’t or similar salad destinations, you will be pleasantly surprised at how beautiful the tuna tataki salad ($9.66) is. I know, I can’t believe I just said that, but it really is worth noting the care with with the thinly sliced seared tuna and avocado are fanned across the vegetables. 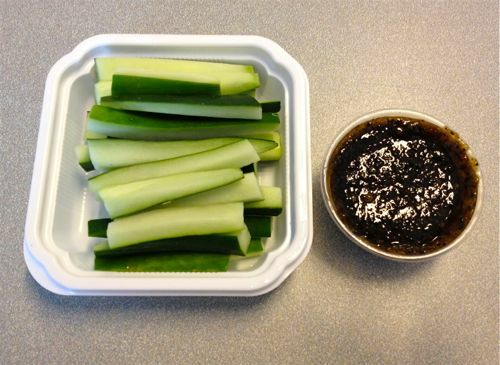 The spicy cucumbers ($2.99) didn’t look that exciting upon first glance, but the spicy sesame dipping sauce makes it worthwhile. This side is also a great alternative to fries if you’re looking to avoid the fried stuff. 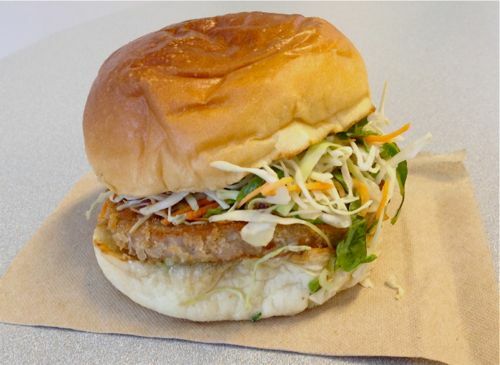 The spicy tuna burger ($8.27) is a thin tuna patty with slaw, miso onions, spicy mayo, wasabi mayo. Although the patty isn’t that flavorful on its own, the whole sandwich put together is really well balanced and filling. Watch out for that wasabi kick, though! 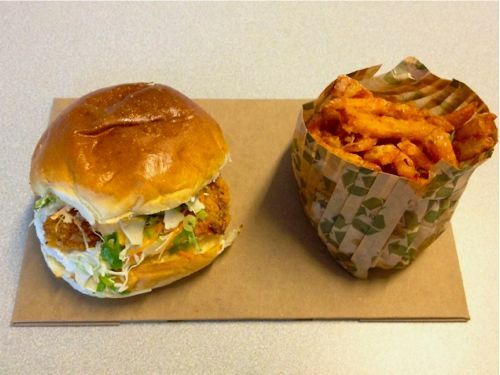 On my last visit, I finally tried the soft shell crab bun ($10.35) with a side of sweet potato fries ($2.99), which was by far my best meal. I can’t think of another place in Midtown to get a soft shell crab sandwich for that price, and it is worth every penny. The “bun” is just a sandwich, on the same roll as the burgers, so size-wise it is not huge but definitely not small either. Not only is there fried soft shell crab in there, but also additional shredded crab mixed with mayo, slaw, spicy mayo and a sweet soy sauce. Really good stuff, and the sweet potato fries that Sarah liked so much in her Flatiron visit were also spot-on. If I were to go back — and I will — it will be difficult for me to try new menu items with this as an option. Posted by Rachel Goldner at 11:45 am, August 16th, 2013 under Kobeyaki.